Many of us tend to take mics for granted since they usually work when we need them to. A little preventive maintenance can make sure they do. Like every other item in the system chain, microphones belong on your PM (Preventive Maintenance) schedule in addition to regular cleaning and repair as needed. Many of us tend to take mics for granted because they usually work every time we pull them out at a show, but a bit of extra attention from time to time helps ensure they keep working properly and optimally. At my company, we clean and check our working inventory of mics, including wireless systems, at least twice a year. January is usually a slow month, so that’s when we schedule a lot of maintenance, with another session dedicated to it after the summer season slows down. Cleaning should be done not only from a hygiene standpoint, but also to get rid of dirt and grime that can affect a mic’s response. Here’s how we do it. Select a particular mic model and then gather up all of the same models in the inventory and place them on the workbench. Look over each one to spot any obvious damage and then shake to see if anything is loose. Next, focus on the connector and inspect the pins. We use an oil free compressor designed for an airbrush to blow away dust and grit in the connector, but a small “duster” can of compressed air also works well. After cleaning, apply an electrical contact cleaner to the pins. Our choice is DeoxIT D5 but any good contact cleaner can be used, just make sure to read the directions and heed all warnings. A cotton swab comes in handy for making sure the contact cleaner gets on all pin surfaces and any excess is wiped away. Then every mic is plugged into the bench PA to see if they’re working correctly. The most common problems we find are dirty units and dented grilles. Getting rid of dirt is an easy fix – set aside all dirty units for a comprehensive cleaning session. Separate out dented or obviously broken units as well. After going through this process with the same model, choose another model type and start the process again, until every mic in the inventory has been addressed. Once that’s done, we’ve got a collection of mics that need cleaning, repair or both. We usually start with the cleaning process. Begin by removing the grille as well as any internal grille foam. (Needle nose pliers come in handy for gently tugging out the internal foam.) If the foam is in good shape, clean it by submerging it in a tub of soapy water, wringing it out and letting it air dry on a towel before reinstalling. If the foam is damaged, discard and replace it. We acquire new foam from mic manufacturers and more generic types from online sources. Scrub grilles with mouthwash, using a toothbrush. Alternately, a cleaning solution comprised of a 50/50 mixture of distilled water and Isopropyl alcohol can be used. Use compressed air to blow away any clogged grime, and then set grilles on a towel to dry. Minor dents in grilles may not affect performance, but they look bad, especially if the performer is on camera. Obvious damage of this type also reflects poorly on the audio provider. More significant dents can be detrimental to performance, either interfering with optimum airflow and/or touching the mic element, which can lead to increased handling noise, not to mention damage to the element and diaphragm. A few basic tools can be employed to remove dents from grilles. The good news is that most grilles can be worked back into shape. For mics with removable grilles, we use a few low-tech tools that go a long way to helping them look like new. 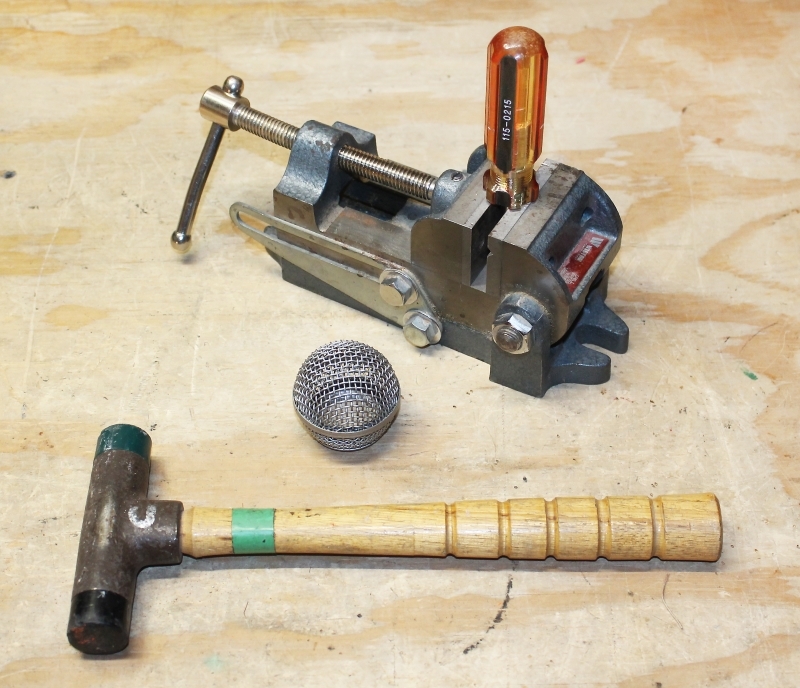 With ball-shaped grilles, we clamp a screwdriver or nutdriver that has a rounded back handle into a bench vise, and then use the rounded back of the handle as an anvil. With the interior foam removed, push the dent against the handle or use a wooden mallet/plastic tip hammer to coax the grille back into shape. For grilles with a flat front end, we clamp a small wood dowel and use the flat end as the anvil. It’s amazing what a little “persuasion” can do. Of course, if a unit is dented beyond repair or broken, it’s time for a replacement. New grilles can be acquired from manufacturers, while “aftermarket” units can be found online and in music stores. There are even aftermarket models available in different colors that can change the look of a mic, perfect for artists who want to look a bit different or when a client wants a mic (or mics) to match a theme, i.e., a pink grille for the announcer at a breast cancer awareness charity fundraiser. We’ve even spray-painted replacement grilles for specific requests. 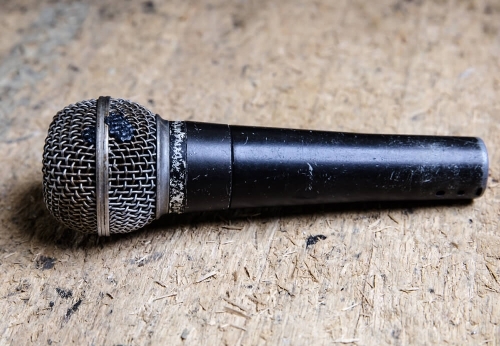 Just make sure the grille is removed from the mic and that there’s ample time for the paint to dry and be fully hardened before handing the mic to a performer. There are also a few commercial mic cleaning products that come in handy at gigs. One we employ is Microphome, a fast-drying foam cleaner and deodorizer that’s alcohol free. Two other cleaning tools always available on gigs are a toothbrush and a small bottle of mouthwash that can be used to give grilles a quick scrub after use, particularly if the previous performer didn’t use a windscreen. Don’t forget to check connectors, clips, mounts, and stands. Don’t forget to factor in mic clamps and clips. We check the plastic or rubber clips for damage and snug up tension screws so the clips can be easily adjusted but will stay in place. Also check the threads that screw onto the mic stand, and make sure any threaded inserts are secure. 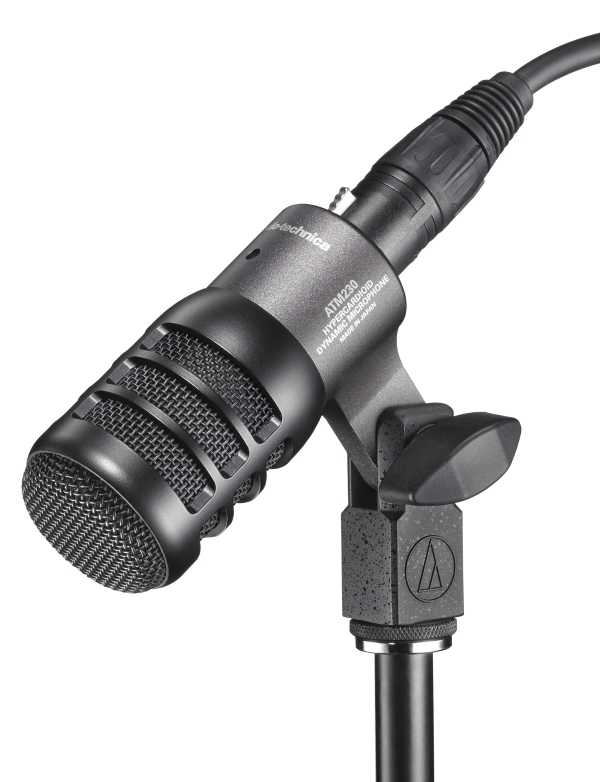 If the inserts are loose, the clip (holding the mic) can fall off the stand at an inopportune moment, not only creating an embarrassing situation but also possibly hurting a performer and/or damaging the mic. To secure loose inserts, we use glue that works with metal as well as plastic/rubber, such as Superglue. Make sure the glue dries fully before placing clips back into rotation. With wireless microphone systems, we check out both transmitters and receivers. Start with transmitters, looking for any damage, and pay extra attention to the battery compartment and cover. Make sure the battery contacts are clean, and bend any wayward ones back into place so they have a solid connection with batteries. Also use DeoxIT on the contacts, gently scrubbing them with a small wire brush. Attention then turns to receivers, where we first look at the antenna connectors. Clean them with DeoxIT as well, and also be sure to check power cords/supplies as well as the screws holding the receivers in the rack to make sure they’re not loose. Fire up the electronics and test each system, changing frequencies to ensure all is working as it should. Lastly, check out the racks themselves for damage, then do general cleaning and lubrication of the hasps and wheels. While maintenance itself is not all that fun, it’s even less fun when a problem that could have been caught with a little Preventative Maintenance rears its ugly head at a gig. No matter the size and scale of your company, set up a PM schedule for all gear and clean mics (especially vocal mics) often. They’ll last longer, work reliably, and the performers will thank you.